View the next message by tapping the next message button. View the previous message by tapping the previous message button. Check for new messages by tapping the check for new messages button. File this message in another folder by tapping the file message button. When the list of folders appears, tap the folder where you want to file the message. Delete this message by tapping the delete message button. You’ll have a chance to cancel in case you tapped the delete message button by mistake. Reply, reply to all, or forward this message by tapping the reply/reply all/forward button. 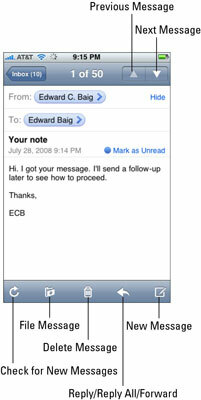 Create a new e-mail message by tapping the new message button. Swipe left or right across the message and then tap the red Delete button that appears to the right of the message. Tap the Edit button in the upper-left corner of the screen, tap the red minus (–) button to the left of the message, and then tap the red Delete button that appears to the right of the message.